not that i have the best kept secrets of the trade....but, when people ask, i offer what i can. hell, they might even come up with even better methods and reciprocate. after all, i'm only here for a short while, i may as well try to teach and learn from others while i still have the energy. 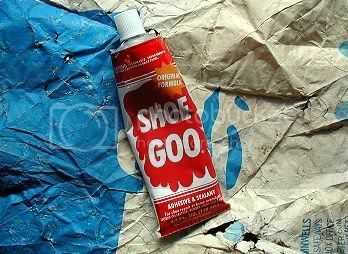 so, today....after many months of trying to find a suitable replacement for clear 'liquid nails' in the tube, (which appears to be off the market) i finally stumbled upon a glue called, 'shoe goo.' so far, i'm pretty jazzed. it has a liberal drying time and seems to be curing quite solidly. for a diehard assemblage/collage artist this might just be good as gold. disclaimer: please note this product states its contents may cause cancer.......but, what DOESN'T these days?!! haha. gel medium may also "cause cancer" and i scoop the stuff out of the jar with my hands. ...for the love of goo, i'd jump in a vat of this stuff!!! Oh god I love the "GOO". They make marine GOO, Automotive GOO, and a lot of other GOO. I think it is all the same they just do that to sell more. I use that stuff all the time. I always buy Marine GOO cause it makes me thing is holds up to water better. Yea, just turning the lock on your front door causes cancer! Dying even causes cancer I think now! i DiD notice they carry many supposedly 'different' kinds....they market it as 'liquid rubber,' so i'm guessing you could MAKE a whole boat outta the stuff!! what a great name for a product, too....can't go wrong with a cutesy cancerous chemical marketing strategy. aaaaaaaaw. ...good enough to kill!!!! i imagine all the kids are sniffing it these days..
COOLNESS....but then, how could you possibly go wrong with 'art at the dump?' chris' work is eerily like mine, i must admit! thanks for the tip E..
i was just looking for an answer about this, as i'm working on ideas to move into more assemblage work. pretty much have just been doing collage and using pva, wasn't sure what to use for assemblage. thanks! Next thing they will say is that tobacco causes cancer, HA! - thanks for tha eva lake link! sh'yah...and 2 buck chuck keeps aaaaaaall that cancer at bay, lucky for me (and charles shaw, of course)!